The Light Hold Forming Pomade adds texture and separation to long or short styles. Clay adds body and thickness, making hair feel fatter. Light formula absorbs quickly. 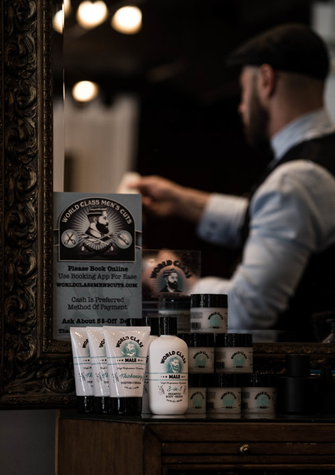 The Medium Hold Moroccan Pomade is a pliable, molding and texturizing paste ideal for creating tousled styles or for smoothing edges. Coconut and Argan Oils help repair, moisturize and add shine to all hair types. No flaking or stiffness and non-greasy. Semi-matte finish. The Firm Hold Matte Pomade is a texturizing paste infused with Lanolin and Beeswax to create texture and separation with a firm yet flexible hold. Natural matte finish. The Thickening Texture Cream is a one of a kind texturizing cream that transforms plain hair into luxuriously thick and voluminous hair. Great for sculpting curls. The 3-in-1 Shampoo, Body & Shave formula nourishes and soothes hair and skin with 11 botanical extracts. Eliminates build-up and gives structural integrity to hair. Use as a gentle cleanser for the body or as a soothing foaming shave cream. Great for all hair and skin types. Safe for colored, straightened and chemically-treated hair.